February 25, 2019, 3:30 PM · As attendance and revenue grow across the theme park industry, other businesses are looking at what elements from theme park experiences they can adopt to increase the appeal of their destinations. The themed entertainment design business now serves everything from museums to casinos as the public looks for unique and engaging experiences when deciding where to spend their money and time. Add Royal Caribbean Cruise Line to the mix of travel businesses stepping up their commitment to theme park-like entertainment. The Miami-based cruise line is finishing a major refurbishment of its private Caribbean island, CocoCay, adding a waterpark and other attractions for guests who are looking for a wider variety of leisure options on their vacations. 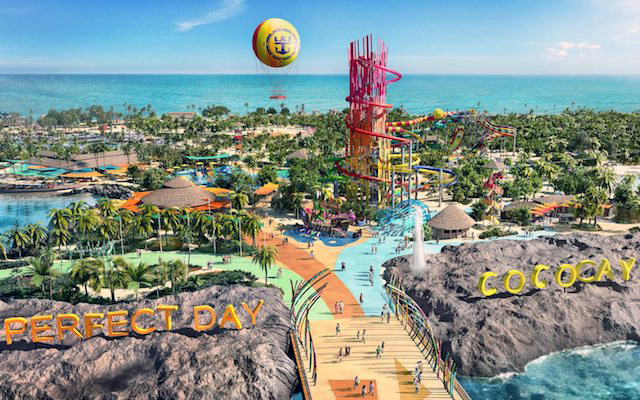 The main phase of the Perfect Day at CocoCay project opens in May, headlined by the Thrill Waterpark — designed by WhiteWater West, which has provided slides and water rides for parks around the world, from Yas Waterworld in Abu Dhabi to Carolina Harbor at Carowinds in the United States. With 13 slides across two towers, the park will have the most slides in the Caribbean and will feature North America's tallest waterslide, the 135-foot Daredevil's Peak. If that's not high up enough for you, CocoCay also will offer the Up, Up, and Away balloon ride, taking riders 450 feet above the island for what the cruise line is calling the highest vantage point in The Bahamas. That ride is coming from Aerophile, the French builder who has provided aerial attractions at Walt Disney World's Disney Springs and the Disneyland Paris Resort. Coming this fall, the cruise line will open the action sports-focused South Beach on the island, with glass-bottom kayaking and paddle boarding, plus volleyball, basketball, soccer... and an inflatable Zorb ball. Also opening later in the year will be an upcharge Coco Beach Club, which also will offer the first overwater cabanas in The Bahamas. Other attractions on the island will include the Caribbean's largest freshwater pool, Oasis Lagoon, with a kid-friendly beach area, a swim-up bar and three swim-up mini islands. Guests looking for a more active adventure could try the Caribbean's largest wave pool for guaranteed surf... or, of course, there's always the beach itself at Chill Island. Complementary attractions on Perfect Day at CocoCay will include Oasis Lagoon, Chill Island, South Beach, and the Splashaway Bay kids' sprayground. Prices for the Thrill Waterpark will range from $44-99 per person for the day, or $39-74 for afternoon-only admission. Up, Up, and Away pricing ranges from $24-99 per person, and there's also a Zip Line ($79-139) available that can be packaged with the waterpark. Here's the full FAQ and price list. Perfect Day at CocoCay will be available on three-to-eight-night cruises to The Bahamas, departing Miami, Port Canaveral, Baltimore, and Cape Liberty in New Jersey, with quoted prices starting at $339 per person, including taxes and fees. Cruise fans, what's your take on the intersection of cruises and themed entertainment? And for those of you who don't take cruises, what would it take to get you on board? The whole attraction of a cruise ship is beyond me. Everything is better on land than on a cruise ship. Hotel rooms are bigger and cheaper, food options are more plenty-full on land, a drink in a bar is cheaper on land, shows, cinema's and casino's are bigger and better, shopping is better, water parks and theme parks are much better on land and above all there is more space and less chance to get sick on land. And clearly the fact you are on the water isn't enough otherwise all those other activities weren't there to distract you from that fact. OT - Have you ever been on a cruise? While some of you assessments are correct (rooms are bigger on land, there's more space on land, shopping is better) plenty of your overviews are fairly glib or erroneous. I'm going on a cruise to Bermuda in eight weeks, did one through the Mediterranean last year, and one to the Bahamas a couple of years before that. They're great - and completely cost comparable to a week at a Disney or Universal resort (which I also love). Except that I can eat all I want (at a WAY more than ample selection of restaurants), drink all I want, watch fantastic shows or movies in huge theatres, take part in or watch games, competitions, gambling, activities - and its all paid for up front. And when the boat stops, I get to step out in another part of the world and have exciting real world experiences in new and/or exotic lands. Not to say its for everybody. To each their own, but I love cruising. @OT - I think the advantage of a cruise is the laid-back atmosphere and pre-planned activities. If you're the type of person that likes to plan things out yourself and negotiate all of your individual activities, then a cruise is probably not for you (which is kind of interesting since so many Drones that plan their WDW trips to the second seem to love to take cruises too). However, if you despise planning everything to the last second, and like the thought of being able to just sit back and enjoy a no-stress vacation, then cruises are a great option. Another advantage of cruising is that it can often cost a lot to transfer between individual Islands and locations if you want to visit more than a couple of spots on a single vacation. That's where I think cruises have the greatest advantage, especially on itineraries with 5+ Ports of Call. Unfortunately, more and more cruises are reducing the ports of call and/or spending a day or longer on these private islands that are becoming more like a day at the beach or theme park instead of exploring the culture and sights of a unique island/city. Considering how fancy cruise ships have gotten over the years, I don't quite understand the need to build such an elaborate water park on a private island (especially when it costs extra) when guests can enjoy water coasters, slides, surfing simulators, and all kinds of other fancy water-based attractions on the ship. I suppose the cruise line has the advantage of the captive audience, and given that so many cruise deals include on-board credit that can be used for excursions like this new water park, that when given the choice of spending time on the boat, on a plain beach, or at the water park, guests are likely to choose the water park when there's very little else to do on the private island. I'm clearly not the cruise type and if you are that is great. I love theme parks but I stopped going to Disney because of the planning. But vacation (for me) is above all, freedom. I think a Viking cruise would fit me because there is nothing to do on board but they are all focusing on the shore excursions. I looked for it to go to Scandinavia but then I'm thinking, why not drive there and see where the road brings me. Cruises are different for me as gone on a few with family. Sure, on-shore stuff is fun but I generally just like finding a good place on deck or other room on ship to sit back and read for a bit. That's my own personal enjoyment as do like the on-ship activities a bit more than the on-shore stuff. I guess it's an "to each their own" bit.